"UQ" and "Queensland University" redirect here. For other universities in Queensland, see Queensland § Universities. For other uses, see UQ (disambiguation). "By means of knowledge and hard work"
The University of Queensland (UQ) is a public research university primarily located in Queensland's capital city, Brisbane, Australia. Founded in 1909 by the state parliament, UQ is Australia's fifth oldest university and is colloquially known as a sandstone university. UQ is considered to be one of Australia's leading universities, and is ranked as the 48th most reputable university in the world. The University of Queensland is a founding member of online higher education consortium edX, Australia's research-intensive Group of Eight, and the global Universitas 21 network. The main St Lucia campus occupies much of the riverside inner suburb of St Lucia, southwest of the Brisbane central business district. Other UQ campuses and facilities are located throughout Queensland, the largest of which are the Gatton campus and the Mayne Medical School. UQ's overseas establishments include the Brunei Clinical School and the UQ-Ochsner Clinical School in Louisiana, United States. The university offers associate, bachelor, master, doctoral, and higher doctorate degrees through a college, a graduate school, and six faculties. UQ incorporates over one hundred research institutes and centres, such as the Boeing Research and Technology Australia Centre, the Australian Institute for Bioengineering and Nanotechnology, and the UQ Dow Centre. Recent research achievements of the university include pioneering the invention of the HPV vaccine that prevents cervical cancer and the development of high-performance superconducting MRI magnets for portable scanning of human limbs. In Australia, UQ is consistently ranked first for business administration and life sciences. UQ's mining engineering and sport science is ranked first and second in the world respectively. UQ has two Nobel laureates (Peter C. Doherty and John Harsanyi) and about a hundred Rhodes Scholars among its alumni and staff. UQ notable alumni also include the first female Governor-General of Australia Dame Quentin Bryce, President of the University of California San Francisco Sam Hawgood, Oscar and Emmy awards winner Geoffrey Rush, triple Grammy Award winner Tim Munro, former Chief Justices of Australia, and the CEO of Dow Chemical Andrew N. Liveris. Proposals for a university in Queensland began in the 1870s. A royal commission in 1874, chaired by Sir Charles Lilley, recommended the immediate establishment of a university. Those against a university argued that technical rather than academic education was more important in an economy dominated by primary industry. Those in favour of the university, in the face of this opposition, distanced themselves from Oxford and Cambridge and proposed instead a model derived from the mid-western states of the United States. A second royal commission in 1891 recommended the inclusion of five faculties in a new university; arts, law, medicine, science and applied science. Education generally was given a low priority in Queensland's budgets, and in a colony with a literacy rate of 57% in 1861, primary education was the first concern well ahead of secondary and technical education. The government, despite the findings of the royal commissions, was unwilling to commit funds to the establishment of a university. The four founding Professors of the University of Queensland, 1911. From left to right: Professor John Lundie Michie (classics), Professor Alexander James Gibson (engineering), Professor Henry James Priestley (mathematics and physics), Professor Bertram Dillon Steele (chemistry). In 1893, the Queensland University Extension Movement was begun by a group of private individuals who organised public lecture courses in adult education, hoping to excite wider community support for a university in Queensland. In 1894, 245 students were enrolled in the extension classes and the lectures were described as practical and useful. In 1906 the University Extension Movement staged the University Congress, a forum for interested delegates to promote the idea of a university. Opinion was mobilised, a fund was started and a draft bill for a Queensland university was prepared. Stress was laid on the practical aspects of university education and its importance for the commerce of Queensland. The proceedings of the congress were forwarded to the Premier of Queensland, William Kidston. In October 1906, sixty acres in Victoria Park were gazetted for university purposes. The University of Queensland was established by an act of state parliament on 10 December 1909 to commemorate the 50th anniversary of Queensland's separation from the colony of New South Wales. The act allowed for the university to be governed by a senate of 20 men and Sir William MacGregor, the incoming governor, was appointed the first chancellor with Reginald Heber Roe as the vice chancellor. Government House (now Old Government House) in George Street was set aside for the university following the departure of the governor to the Bardon residence, Fernberg, sparking the first debates about the best location for the university. In 1910 the first teaching faculties were created. These included engineering, classics, mathematics and chemistry. In December of the same year, the senate appointed the first four professors; Bertram Dillon Steele in chemistry, John Lundie Michie in classics, Henry James Priestley in mathematics and Alexander James Gibson in engineering. In 1911 the first students enrolled. The university's first classes in the Government House were held in 1911 with 83 commencing students and Sir William MacGregor is the first chancellor (with Reginald Heber Roe as vice-chancellor). 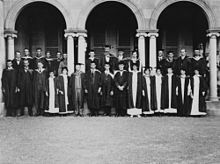 The University of Queensland began to award degrees to its first group of graduating students in 1914. Construction of the Forgan Smith Building began in 1938. The development of the university was delayed by World War I, but after the first world war the university enrollments for education and research took flight as demand for higher education increased in Australia. Thus, in the early 1920s the growing university had to look for a more spacious campus as its original site in George Street, Brisbane, had limited room for expansion. In 1927, James O'Neil Mayne and his sister, Mary, provided a grant of approximately £50,000 to the Brisbane City Council to acquire 274 acres (111 ha) of land in St Lucia and provided it to the University of Queensland as its permanent home. In the same year, the pitch drop experiment was started by Thomas Parnell. The experiment has been described as the world's oldest and continues to this day. Lack of finance delayed development of the St Lucia campus. Hence, the construction of the university's first building in St Lucia only began in 1938. It was later named the Forgan Smith Building, after the premier of the day and it was completed in 1939. During World War II, the Forgan Smith Building was used as a military base and it served first as advanced headquarters for the Allied Land Forces in the South West Pacific. Victor and Evelyn Lewis Fountain, in the main lake at the St Lucia campus. This is a 2012 replica, which replaced the 1960s fibreglass original, designed by Kelvin Crump. The first Doctor of Science was awarded in 1942. The first PhD was awarded in 1952. Former President of the United States, Barack Obama recognised UQ as "one of the world’s great institutions of science and teaching", in his speech at UQ's St Lucia campus. In 1990, Australia reorganised its higher education system by abolishing the binary system of universities and colleges of advanced education. Under this transition, the university merged with Queensland Agricultural College, to establish the new UQ Gatton campus. In 1999, UQ Ipswich began operation as one of the completely Web-enabled campuses in Australia. In 2010, the University of Queensland was a recipient of the Queensland Greats Awards. In May 2013, UQ joined edX, an international consortium of massive open online courses (MOOCs). Due to start in May 2014, the initial four UQx courses will cover hypersonics, tropical coastal ecosystems, biomedical imaging and the science of everyday thinking. The University of Queensland is organised into a number of divisions for academic, administrative and logistical purposes. The senate is the governing body of the University of Queensland and consists of 22 members from the university and community. The senate is led by the chancellor and deputy chancellor, elected by the senate. The University of Queensland Act 1998 grants the senate wide powers to appoint staff, manage and control university affairs and property and manage and control finances to promote the university's interests. The vice-chancellor is the university's chief executive officer and is appointed by and responsible to the senate for the overall direction of strategic planning, finance and affairs of the university and also acts as the president of the university. The vice-chancellor is supported by an Executive to whom the university's organisational units report and provides advice on policy and administrative matters relating to their area of responsibility. The academic board is the university's senior academic advisory body. It formulates policy on academic matters including new programs, teaching, learning and assessment, research, promotions, student academic matters, prizes and scholarships. An academic board member is elected annually as its president. The president is assisted by a half-time deputy president. Its members include the vice-chancellor's executive, executive deans of faculties, institute directors, heads of schools, dean of the graduate school, directors of central service units, the university academic registrar, the president of the UQ student union and five student representatives. The university has six faculties to support both research and teaching activities. UQ has a semester-based modular system for conducting academic courses. The Australian higher education model features a combination of the British system, such as small group teaching (tutorials) and the American system (course credits). Over a decade, UQ received more than $200m in additional revenue from billionaire Chuck Feeney’s Atlantic Philanthropies, which matched funding with the Beattie government’s Smart State program. UQ is ranked 55th in the world in the Academic Ranking of World Universities 2018, 48th in the world in the QS World University Rankings and 69th in the world in the Times Higher Education World University Rankings 2019. UQ is ranked 37th in the world in the CWTS Leiden Ranking 2018. The University of Queensland is ranked in the top 100 prestigious universities around the world (65th in 2018) in the Times Higher Education’s Top 100 Most Reputable Universities in the World. Overall, UQ Business School's Master of Business Administration degree is ranked first in Asia Pacific and top 10 globally in The Economist Intelligence Unit 2016 MBA ranking. UQ's MBA degree is ranked 1st in Australia by the Australian Financial Review. UQ is also the top Australasia institution for life sciences in the U.S. News & World Report and the Academic Ranking of World Universities. The university is also highly ranked in various engineering disciplines. In mining engineering, it stands in 10th worldwide, in chemical engineering 24th worldwide, in civil engineering 42nd worldwide, in material science and engineering 48th worldwide, and in electrical and electronic engineering it is ranked within 51-100th worldwide. In the Center for World University Rankings (CWUR) inaugural world subject rankings, UQ ranked first in Biodiversity Conservation, and top 10 in 13 subjects based on the numbers of research articles published in top-tier journals. In the QS World University Rankings by Subject 2018, UQ ranked in the top 50 in the world in 22 subjects, and first in Australia for Chemical Engineering and Environmental Sciences. Queensland has a strong research focus in science, medicine and technology. The university's research advancement includes pioneering the development of the cervical cancer vaccines, Gardasil and Cervarix, by UQ Professor Ian Frazer. In 2009, the Australian Cancer Research Foundation reported that UQ have taken the lead in numerous areas of cancer research. UQ's research is rated above world standard in more broad fields than at any other Australian university (in 22 broad fields), and more UQ researchers are working in research fields that ERA has assessed as above world standard than at any other Australian university. UQ research in biomedical and clinical health sciences, technology, engineering, biological sciences, chemical sciences, environmental sciences, and physical sciences was ranked above world standard (rating 5). In 2015, UQ is ranked by Nature Index as the research institution with the highest volume of research output in both interdisciplinary journals Nature and Science within the southern hemisphere, with approximately twofold more output than the global average. As part of the research the university carries out, Professor Jane Hunter heads the e-Research Lab, which is dedicated to supporting all areas of research in the university. Aside from disciplinary-focused teaching and research within the academic faculties, the university maintains a number of interdisciplinary research institutes and centres at the national, state and university levels. For example, the Asia-Pacific Centre for the Responsibility to Protect, the University of Queensland Seismology Station, Heron Island Research Station and the Institute of Modern Languages. The University of Queensland plays a key role in Brisbane Diamantina Health Partners, Queensland's first academic health science system. This partnership currently comprises Children's Health Queensland, Mater Health Services, Metro North Hospital and Health Service, Metro South Health, QIMR Berghofer Medical Research Institute, Queensland University of Technology, The University of Queensland and the Translational Research Institute. UniQuest is the main commercialisation company of the University of Queensland and specialises in global technology transfer and facilitates access for all business. UniQuest has created over 70 companies from its intellectual property portfolio, and since 2000 UniQuest and its start-ups have raised more than $490 million to take university technologies to market. UQ technologies licensed by UniQuest include UQ's cervical cancer vaccine technology, image correction technology in magnetic resonance imaging machines, and the Triple P Positive Parenting Program. The University of Queensland maintains a number of support and student services. The campuses at St Lucia and Gatton have Student Centres which provide information and support services. The UQ Union is the peak student representation body that coordinates various student services and activities, including over 190 affiliated clubs and societies, some of whom are listed below. UQ Sport offers a wide range of sport, fitness and recreation opportunities at the St Lucia and Gatton campuses of The University of Queensland. Its facilities and services are open to students, staff, alumni, and the general public. The UQ Aquatic Centre is operated by UQ Sport and consists of three pools; 50-metre and 25-metre outdoor heated pools and a small enclosed heated teaching pool. The main pool is a 50m lap pool with a minimum of three lanes dedicated to public lap swimming throughout the opening hours. The UQ Athletics Centre maintains an Olympic standard 8 lane synthetic track and grandstand able to accommodate up to 565 spectators. The UQ Sport and Fitness Centre is a multi-purpose indoor facility. The UQ Tennis Centre is the largest tennis centre in both Brisbane and Queensland. The UQ Playing Fields and Ovals is also managed by UQ Sport, home to a total of eight oval fields at the St Lucia campus. The majority are designated for use by particular sports including cricket, rugby and soccer. These ovals are also used for recreational activities and lunchtime social sport. Three Minute Thesis In 2008, the university originated the Three Minute Thesis competition for students completing a higher degree by research. Three Minute Thesis is now held annually at universities across Australasia. It challenges participants to present their research in just 180 seconds, in an engaging form that can be understood by an intelligent audience with no background in the research area. This exercise develops presentation, research and academic communication skills and supports the development of research students' capacity to explain their work effectively. Inspired by the Trinity College Great Court Run of the University of Cambridge, the University of Queensland organises an annual 636m sprint race around the UQ sandstone Great Court. Market Day During Orientation week and the first week of each semester, Market Day is organised throughout Campbell Place and the Great Court at the St Lucia Campus. The UQ Union and clubs and societies have stalls and organises social activities. Careers Fair The UQ Careers Fair is an annual event that brings together university students and major employers from across the country. Degree-specific Careers Fairs are also held annually or bi-annually, such as the Engineering Careers Expo. The University of Queensland has 11 residential colleges with 10 of these located on its St Lucia campus and one on its Gatton campus. The University of Queensland Intercollege Council is the organisational and representative body for the residential colleges which coordinates sporting and cultural events and competitions. Cromwell College is a co-ed college founded in 1950. It is affiliated with the Uniting Church and accommodates 247 students. Duchesne College is a women's only college founded in 1937 in Toowong, moving the university in 1959. It is affiliated with the Society of the Sacred Heart and accommodates 200 students. Emmanuel College is a co-educational college founded in 1911. It accommodates 350 students. Gatton Halls of Residence was established in 1897 and has 440 residential students, making it by far the largest and oldest college at the University. Grace College is a women's college founded in 1970. It accommodates 180 students. International House is a co-educational college for International and Australian students founded in 1965. King's College provides accommodation for 260 male students of the University. St John's College is a co-educational college founded in 1911. It is administered by the Anglican Diocese of Brisbane. St Leo's College is a men's college affiliated with the Roman Catholic Archdiocese of Brisbane. Union College is a co-educational, secular college named after the student union. It is listed on the Queensland Heritage Register. Women's College is a college for female students. The University of Queensland maintains a number of campuses and facilities throughout Queensland. UQ has its main campus in the suburb of St Lucia in Brisbane, bordered by a meander in the Brisbane River to the north, east, and south. UQ's main campus has been recognized for its beauty by a number of sources. Its other campuses include Gatton and Herston. In 1927, the land on which the St Lucia campus is built was resumed by the Brisbane City Council using money donated by James O'Neil Mayne and his sister Mary Emelia Mayne to replace the less spacious city campus. The city campus is now home to the Gardens Point campus of the Queensland University of Technology. Construction of the new university at St Lucia began in 1937. At its centre is the heritage-listed Great Court – a 2.5 hectares (6.2 acres) open area surrounded by Helidon sandstone buildings with grotesques of great academics and historic scenes, floral and faunal motifs and crests of universities and colleges from around the world. This central semi-circular quadrangle features a connected arcade so students could reach any section under cover. The Great Court was added to the Queensland Heritage Register in 2002. The University of Queensland Art Museum is located in the James and Mary Emelia Mayne Centre on the St Lucia campus. The Art Museum was established in the Forgan Smith Tower in 1976 to house the artworks collected by The University of Queensland since the 1940s, relocating to its present site in 2004. Today, with more than 3,000 artworks, the University's Art Collection is Queensland's second largest public art collection. The university also houses the R.D. Milns Antiquities Museum in the Michie building (bldg 9, level 2) which contains Queensland's only publicly accessible collection of antiquities from ancient Rome, Greece, Egypt and the Near East. The museum supports research and teaching at the university. The UQ Anthropology museum (also in the Michie Building on level 1) contains a significant collection of ethnographic material. It is also open to the public. The UQ Gatton Campus is a 1068-hectare campus which is located at Lawes, Queensland, near the town of Gatton, Queensland, about 90 kilometres (56 mi) west of Brisbane on the Warrego Highway. The campus was opened in 1897 next to the site of the Queensland Agricultural College which was then amalgamated with UQ in 1990. UQ Gatton is the core campus for research, learning and teaching activities and facilities in agriculture, animals, veterinary science and the environment. In 2008 the Centre for Advanced Animal Science (CAAS) was opened at the Gatton campus – a collaborative venture between UQ and the Queensland Government. UQ Mayne Medical School and the Queensland Institute of Medical Research is the core campus for clinical health teaching and research. The campus is situated in Herston and operates within Queensland Health system of the Royal Brisbane Hospital, Royal Children's Hospital, Royal Women's Hospital and the Queensland Institute of Medical Research. It is home to the Faculty of Medicine, the School of Population Health, the Herston Health Sciences Library, the Centre for Clinical Research and clinical research and learning activities of the School of Nursing and Midwifery. The medical school building was added to the Queensland Heritage Register in 1999. The Marks-Hirschfeld Museum of Medical History is located in the Mayne Medical School at the Herston campus. Operated by volunteers and supported by the University of Queensland Alumni, it has a collection of over 7,000 items of medical memorabilia, medical and surgical instruments. The focus is on the study of medical history in Queensland, but the collection includes items with broader significance to Australia and internationally. Louisiana, United States - the UQ-Ochsner Clinical School operates at Ochsner Medical Center, New Orleans and Baton Rouge, allowing medical school students from the UQ-Ochsner program to receive two years of overseas clinical experience, contributing towards their UQ Doctor of Medicine (MD) degree. Brunei - the Brunei Clinical School operates at Raja Isteri Pengiran Anak Saleha Hospital, Bandar Seri Begawan and Panaga, as a UQ establishment with the Brunei Ministry of Health as a partner. The Ipswich campus was made up of nearly 20 buildings and more than 5001 students on nearly 25 hectares (62 acres). Courses offered included: arts, business, medicine and social sciences as well as Interaction design. It is located near central Ipswich, Queensland, just south of the CBD. Nearby landmarks include Limestone Park, Workshops Rail Museum and RAAF Base Amberley. The site dates back to 1878 with the opening of the Ipswich branch of the Woogaroo Lunatic Asylum. Operations continued until 1910 when it became the Ipswich Hospital for the Insane. In 1938 it was renamed the Ipswich Mental Hospital and in 1964 it was renamed again as the Ipswich Special Hospital. It was finally named the Challinor Centre in 1968 in honour of Dr Henry Challinor, the ship's surgeon on the Fortitude. From 1968-97 the Challinor Centre served as an institution for people with intellectual disabilities. In late 1997 the Challinor Centre began its first stage of transformation as the new UQ Ipswich campus. In 2014, UQ sold the Ipswich Campus to the University of Southern Queensland, believing that this regional teaching campus would be better utilised by USQ. There are other research and education facilities not directly attached to the three campuses. These locations are primarily for research, which cannot be undertaken in the campus locales but also represent buildings which established pre-eminence in education before the creation of the current campuses. Queen Street, Brisbane is the location of the Customs House and the UQ Business School Downtown Venue. Customs House is one of Brisbane's heritage icons and is located on the river along Queen Street in the Brisbane central business district. It is owned and operated by the University of Queensland as a cultural, educational and heritage facility. The UQ Business School Downtown is an inner-city corporate education, meeting and dining venue and facility which is situated on Level 19 of Central Plaza One in the Brisbane central business district. Indooroopilly is the site of the Julius Kruttschnitt Mineral Research Centre and the Queensland University Regiment Logistics Company. The Julius Kruttschnitt Mineral Research Centre (JKMRC) of the University of Queensland Sustainable Minerals Institute is situated at a former silver and lead mine located at Finney's Hill in Indooroopilly. Acquired in 1951 by the School of Mining Engineering under the leadership of Frank T. M. White, Foundation Professor (appointed 1950), this mine (formerly Finney's Hill United Silver Mines Limited) then became known as the Queensland University Experimental Mine. It promptly became an integral part of the teaching and research capacity of the School, which in 1952 expanded to become the Department of Mining and Metallurgical Engineering. JKMRC, incorporating the Experimental Mine, was officially established as a University Centre in 1970, with a goal to develop practical technical solutions for large-scale mining and minerals industry challenges. It is named after Julius Kruttschnitt, the chairman of Mount Isa Mines and a board member of the university's Faculty of Engineering. The Queensland University Regiment Logistics Company is housed in the Witton Barracks, Indooroopilly. UQ has a research station at Heron Island. Heron Island – the Heron Island Research Station is situated on Heron Island, 72 kilometres (45 mi) north-east of Gladstone. Its primary use is for coral reef ecology research and teaching and is an integral component of the Great Barrier Reef Ocean Observations System and the national Integrated Marine Observing System. It consists of over thirty buildings situated on a two hectare lease. Low Isles – the Low Isles Research Station is located 15 kilometres (9.3 mi) northeast of Port Douglas in Northern Queensland in a lagoon area of the Marine National Park Zone of the Great Barrier Reef. Moreton Bay – the Moreton Bay Research Station and Study Centre is located in Dunwich on North Stradbroke Island and researches the ecosystems. Mt Nebo – the University of Queensland operates an International Seismograph Station on Mt Nebo. 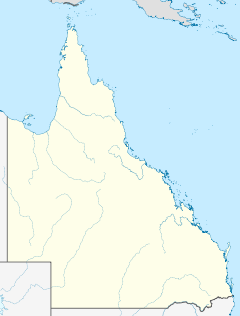 Charters Towers – the University of Queensland operates an International Seismograph Station at Charters Towers. Dayboro – the Dayboro Veterinary Surgery was bought by the university in 1987 as a teaching clinic for fifth year veterinary students in their dairy cattle medicine rotation. Later, separate brick accommodation was built for student accommodation. Research projects into practical aspects of dairy production are frequently carried out by clinic staff. There is a full range of veterinary services and pet care for dogs, cats, horses, cows, alpacas, goats, and all manner of other small and large animals. University of Queensland Library was founded in 1910. It developed from a small provincial university library into a major research library. It consists of 13 branches. The university is served by the University of Queensland ferry wharf, the westernmost stop and terminus of the CityCat service. TransLink also operates two bus stations on campus: the University of Queensland bus station at Chancellor's Place in the west, connecting passengers to Brisbane's inner west suburbs such as Indooroopilly, Toowong and Milton; and the UQ Lakes busway station in the east, the western terminus of the Eastern Busway, with services to Brisbane's inner south suburbs such as Woolloongabba, Carindale and Mount Gravatt via the Eleanor Schonell Bridge. This bridge also allows pedestrians and cyclists to cross the Brisbane River, to reach Dutton Park. The closest stops of the Queensland Rail City network are the Toowong railway station, Park Road railway station, and Dutton Park railway station. There are 3 refectories that provide food for students. These are the Main Refectory in the Student Union Complex, the Biological Sciences Refectory under the Biological Sciences Library, and the Physiology Refectory under the Physiology Lecture Theatres. The Student Union Complex houses the Student Union and other student services. UQ has produced numerous distinguished alumni. Several notable examples include recipient of a Nobel Prize in Physiology and Medicine Peter C. Doherty, recipient of the "Triple Crown of Acting" (having won Primetime Emmy, Tony and Academy Awards) Geoffrey Rush, triple Grammy Award-winning musician Tim Munro, former Chief Justices of Australia Sir Gerard Brennan and Sir Harry Gibbs, international not-for-profit 'Hear and Say' founder and officer of the order of Australia Dimity Dornan, Principal of King's College London Edward Byrne, singer and eurovision representative Dami Im, CEO of Dow Chemical Andrew N. Liveris, the first female Governor-General of Australia Dame Quentin Bryce, former Singaporean Minister of Defence and Manpower Lee Boon Yang, consecutive Olympic gold medal-winning swimmer David Theile, highly cited epidemiologist Graham Colditz, international best-selling author Kate Morton, and CEO of MS Research Australia and Harvard Club of Australia fellow, Dr Matthew Miles. Between 2011 and 2016 there were 38 officially reported cases of sexual assault and harassment on campus, resulting in 1 expulsion and 2 one week suspensions. This included a report in 2015 where a staff member "filmed someone in the shower. Police laid charges and the perpetrator’s casual employment at UQ was discontinued." These figures are lower than the 2017 Australian Human Rights Commission report on sexual assault and harassment which found reported figures higher than this. The vice-chancellor responded "there is no place for sexual assault or sexual harassment at UQ. Such behaviour is never the victim’s fault, and it will not be tolerated here" and committed UQ to introduce a number of new initiatives to address problems. to freeze all new investments and phase out all current investments in coal, petroleum and gas over the next five years because fossil fuels drive climate change. On 18 April 2016, students occupied the Vice Chancellory stating, 'We are asking the university to remove investment from the top 200 most polluting companies in the world' and calling for greater transparency regarding University investments. The sit in resulted in communication with the Vice Chancellor in May 2016. In October 2016 Fossil Free QUT provided a report to the University Senate. For the period July 2015 to June 2016 direct fossil fuel companies comprised an average of 3.82% of UQ's $169.2m investment portfolio. The University Senate voted not to divest from fossil fuels citing, 'that divestment would make no real difference'. In September 2013 350.org Australia released a report 'Exposing The Ties' to show 'shows how key decision makers at some of the country's leading tertiary institutions including the University of Queensland, University of Newcastle and University of New South Wales are non-executive directors or former employees of fossil fuel companies including AGL, BHP and Rio Tinto.' This showed The University of Queensland received $31million from the Australian Coal Association Research Program (ACARP) and the University's Senate includes three non-executive directors of Senex Energy, Metro Mining and Queensland Investment Corporation, (owner of Epic Energy and Lochard Energy) and a former Queensland Resources Council Board Member and recipient of the Queensland Resources Council Medal. Seven of the 22 members of the senate for UQ have interests in the fossil fuel industry, having ties with fossil fuel companies previously or currently. In October 2017 ten students occupied the Chancellor's Office deeming the 2016 Senate vote on divestment illegitimate due to the conflicts of interest. The students were removed by police. ^ "History of the University seal - About UQ". Uq.edu.au. Archived from the original on 12 November 2016. Retrieved 12 November 2016. ^ "Annual Report 2015" (PDF). The University of Queensland. Archived (PDF) from the original on 13 July 2016. ^ a b c d "UQ fast facts". The University of Queensland. Archived from the original on 19 January 2018. Retrieved 2 April 2019. ^ a b c d e Thomis, Malcolm I. (1985). A place of light & learning : the University of Queensland's first seventy-five years (PDF). St. Lucia, Qld. : University of Queensland Press. p. 429. ISBN 9780702217975. ^ "QS World University Rankings 2019". Top Universities. 5 June 2017. Retrieved 19 June 2018. ^ "Schools and Partners". edX. Archived from the original on 14 November 2016. Retrieved 12 November 2016. ^ "Magnetic Resonance Imaging pioneer honoured - UniQuest". UniQuest. 15 June 2012. Archived from the original on 3 March 2017. Retrieved 12 November 2016. ^ a b "Life sciences 2017". Times Higher Education. Archived from the original on 14 November 2016. Retrieved 12 November 2016. ^ a b "Academic Ranking of World Universities in Life and Agriculture Sciences - 2016 | 2016 Top 100 Universities in Natural Sciences and Mathematics". Shanghairanking.com. Archived from the original on 20 November 2016. Retrieved 12 November 2016. ^ a b "2016 MBA & Business School Rankings". The Economist. Archived from the original on 16 October 2016. Retrieved 12 November 2016. ^ "New Ranking of the World's Top Mining Engineering Schools". 21 March 2016. Retrieved 6 March 2018. ^ "Queensland Rhodes Scholars". Retrieved 31 March 2019. ^ a b c d e "University of Queensland Medical School (entry 601167)". Queensland Heritage Register. Queensland Heritage Council. Retrieved 6 July 2013. ^ "FIRST GRADUATES". Trove. Retrieved 12 October 2016. ^ Katie Hunt (30 April 2013). "World's oldest experiment ready for a drop of excitement". CNN. Cable News Network. Archived from the original on 22 February 2014. Retrieved 6 July 2013. ^ "Something's missing in our lives…and is set to make a comeback". UQ News. Retrieved 10 September 2018. ^ "WOMAN FIRST SCIENCE DOCTOR AT VARSITY - The Courier-Mail (Brisbane, Qld. : 1933-1954) - 18 June 1942". Trove. Retrieved 12 October 2016. ^ "UQ celebrates 5000th PhD graduate". UQ News. Archived from the original on 12 October 2016. Retrieved 12 October 2016. ^ "Emmannel College Scheme - Townsville Daily Bulletin (Qld. : 1907-1954) - 20 March 1953". Trove. Retrieved 12 October 2016. ^ "Remarks by President Obama at the University of Queensland". Whitehouse.gov. 15 November 2014. Archived from the original on 10 November 2016. Retrieved 12 November 2016. ^ "History of UQ - About UQ - The University of Queensland, Australia". Uq.edu.au. Archived from the original on 17 October 2016. Retrieved 12 October 2016. ^ "2010 Queensland Greats recipients". Queensland Government. Archived from the original on 31 May 2017. Retrieved 31 May 2017. ^ "UQx". 12 November 2013. Archived from the original on 19 February 2017. ^ "THE UNIVERSITY OF QUEENSLAND ORGANISATION" (PDF). Uq.edu.au. August 2016. Archived (PDF) from the original on 15 December 2016. Retrieved 12 November 2016. ^ "Academic Board". Uq.edu.au. 13 March 2013. Archived from the original on 14 November 2016. Retrieved 12 November 2016. ^ "Funds help push University of Queensland up the global rankings". The Australian. 16 August 2016. Retrieved 23 February 2017. ^ a b "QS World University Rankings 2019". Quacquarelli Symonds Limited. ^ "World University Rankings 2019". TSL Education Limited. ^ "U.S. News and World Report Best Global Universities Rankings". U.S. News and World Report. ^ a b "CWTS Leiden Ranking 2017". Centre for Science and Technology Studies, Leiden University. ^ "THE 2019 - Australia". Times Higher Education. ^ "Academic Ranking of World Universities 2018 - Australia". Shanghai Ranking Consultancy. ^ "U.S. News and World Report Best Global Universities in Australia/New Zealand". U.S. News and World Report. ^ "All unis winners in research audit". The Australian. 4 December 2015. Archived from the original on 31 December 2016. Retrieved 21 February 2017. ^ "Australian University Rankings". Australian Education Network. ^ "ARWU World University Rankings 2018 - Academic Ranking of World Universities 2017 - Top 500 universities - Shanghai Ranking - 2017". www.shanghairanking.com. Archived from the original on 15 August 2017. Retrieved 6 March 2018. ^ "University of Queensland". UniversityRankings.ch. The State Secretariat for Education, Research and Innovation and swissuniversities. Archived from the original on 30 October 2016. Retrieved 17 January 2017. ^ "JCU surprise package in Leiden ranking". The Australian. 19 May 2016. Retrieved 14 January 2017. ^ (CWTS), Centre for Science and Technology Studies. "CWTS Leiden Ranking". CWTS Leiden Ranking. Retrieved 28 May 2018. ^ "University Rankings". Top Universities. Retrieved 28 May 2018. ^ "Innovation can be learned, says University of Queensland's new MBA director". 31 March 2017. Archived from the original on 8 August 2017. Retrieved 6 March 2018. ^ "QS World University Rankings by Subject 2018". Retrieved 23 November 2018. ^ "Academic Ranking of World Universities in Life and Agriculture Sciences - 2016 | 2016 Top 100 Universities in Natural Sciences and Mathematics". cwur.org. Archived from the original on 22 May 2017. Retrieved 29 May 2017. ^ "::: RANKINGS BY SUBJECT - 2017 | CWUR". cwur.org. Archived from the original on 22 May 2017. Retrieved 29 May 2017. ^ "::: METHODOLOGY". cwur.org. Archived from the original on 27 May 2017. Retrieved 29 May 2017. ^ "QS World University Rankings by Subject 2018". Archived from the original on 4 March 2018. Retrieved 6 March 2018. ^ "Engineering - Chemical". 22 February 2018. Retrieved 6 March 2018. ^ "Environmental Sciences". 22 February 2018. Retrieved 6 March 2018. ^ McNeil C (April 2006). "Who invented the VLP cervical cancer vaccines?". J. Natl. Cancer Inst. 98 (7): 433. doi:10.1093/jnci/djj144. PMID 16595773. Archived from the original on 1 August 2009. Retrieved 11 November 2009. ^ "Queensland takes the lead on cancer research". Australian Cancer Research Foundation. Archived from the original on 13 September 2009. Retrieved 20 July 2009. ^ "UQ researchers gain international recognition". Uq.edu.au. Archived from the original on 14 March 2016. Retrieved 12 October 2016. ^ "Excellence in Research for Australia 2012" (PDF). Archived from the original (PDF) on 20 January 2013. Retrieved 10 December 2016. ^ "Nature Index: Australia" (PDF). Nature. 519 (7544): S64–S65. 2015. doi:10.1038/519S64a. PMID 25806697. Archived from the original on 6 April 2017. Retrieved 12 November 2016. ^ "Research at UQ". Archived from the original on 4 May 2013. Retrieved 11 May 2017. ^ CSIRO. "St Lucia, Queensland Biosciences Precinct". Archived from the original on 18 February 2017. ^ "Boeing opens research centre at UQ". Archived from the original on 4 March 2018. Retrieved 6 March 2018. ^ "The Dow Chemical Company and University of Queensland sign groundbreaking $10 million strategic partnership". Archived from the original on 4 March 2018. Retrieved 6 March 2018. ^ "Brisbane Diamantina Health Partners". Archived from the original on 10 June 2017. Retrieved 30 May 2017. ^ "About UniQuest". UniQuest. Archived from the original on 3 December 2016. Retrieved 12 November 2016. ^ "Student Centre - The University of Queensland, Australia". Archived from the original on 19 February 2017. ^ "UQ Sport". UQSport.com. Archived from the original on 19 October 2016. Retrieved 12 November 2016. ^ "Athletics Centre". UQ Sport. Archived from the original on 25 January 2014. Retrieved 12 November 2016. ^ "Fitness Centre". UQ Sport. Archived from the original on 4 February 2014. Retrieved 12 November 2016. ^ "Tennis Centre". UQ Sport. Archived from the original on 4 February 2014. Retrieved 12 November 2016. ^ "Three Minute Thesis - The University of Queensland, Australia". Archived from the original on 19 February 2017. ^ "Young meets old for UQ tradition - UQ News". Uq.edu.au. Archived from the original on 20 May 2013. Retrieved 12 November 2016. ^ "2010 Great Court Race - UQ Events". Uq.edu.au. 12 May 2010. Archived from the original on 30 June 2017. Retrieved 12 November 2016. ^ www.nbm.com.au, New Business Media -. "About". Archived from the original on 19 February 2017. ^ "UQ Careers Fair - UQ Events, The University of Queensland". Uq.edu.au. 30 March 2011. Archived from the original on 30 June 2017. Retrieved 12 November 2016. ^ "Students build biggest engineering careers expo - UQ News". Uq.edu.au. Archived from the original on 20 May 2013. Retrieved 12 November 2016. ^ "Union College (entry 602504)". Queensland Heritage Register. Queensland Heritage Council. Retrieved 16 November 2014. ^ "Other campuses and facilities - The University of Queensland, Australia". Uq.edu.au. 12 July 2013. Archived from the original on 6 April 2016. Retrieved 12 November 2016. ^ "Campuses and Locations - About UQ". Uq.edu.au. 8 January 2015. Archived from the original on 12 November 2016. Retrieved 12 November 2016. ^ "25 Of The Most Beautiful College Campuses In The World". Buzzfeed.com. 4 February 2013. Archived from the original on 19 November 2016. Retrieved 12 November 2016. ^ "10 most beautiful universities, Australia". Times Higher Education. 12 February 2018. Retrieved 2 November 2018. ^ a b Readshaw, Grahame; Ronald Wood (1987). Looking up looking back at old Brisbane. Bowen Hills, Queensland: Boolarong Publications. p. 62. ISBN 978-0-86439-032-5. 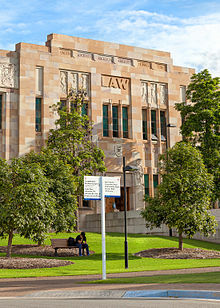 ^ "University of Queensland, Great Court Complex (entry 601025)". Queensland Heritage Register. Queensland Heritage Council. Retrieved 6 July 2013. ^ "About us - UQ Art Museum". Artmuseum.uq.edu.au. Archived from the original on 9 November 2016. Retrieved 12 November 2016. ^ "Antiquities Museum - The University of Queensland, Australia". Uq.edu.au. 26 October 2012. Archived from the original on 4 November 2016. Retrieved 12 November 2016. ^ "About Us - Antiquities Museum". Uq.edu.au. 31 December 2015. Archived from the original on 13 October 2016. Retrieved 12 November 2016. ^ "UQ Anthropology Museum - The University of Queensland, Australia". www.anthropologymuseum.uq.edu.au. Archived from the original on 28 May 2017. Retrieved 30 May 2017. ^ "About - Gatton CampusAustralia". Uq.edu.au. 16 September 2016. Archived from the original on 15 August 2016. Retrieved 12 November 2016. ^ Robinson, Penny (1 September 2008). "UQ Gatton becomes hub of animal research". UQ News Online. Archived from the original on 29 May 2012. Retrieved 21 June 2012. ^ "UQ Marks-Hirschfeld Museum". Brisbane Living Heritage Network. Archived from the original on 6 March 2018. Retrieved 15 June 2017. ^ "UQ-Ochsner medical program". University of Queensland. Archived from the original on 16 February 2017. Retrieved 30 January 2017. ^ "Brunei Clinical School". University of Queensland. Archived from the original on 19 September 2016. Retrieved 30 January 2017. ^ Trounson, Andrew (21 July 2014). "USQ to make a go of UQ underused Ipswich campus". The Australian. Retrieved 8 May 2015. ^ "a cultural, educational and heritage facility of the University of Queensland". Customs House. Archived from the original on 20 October 2016. Retrieved 12 November 2016. ^ Finney's Hill United Silver Mines Limited. Reports and Statement of Accounts for Year ended 30 June 1924. Registered Office: Commerce House, Adelaide Street, Brisbane. 1924. ^ White FTM. The Queensland University Experimental Mine. Paper No 128, Vol 6, pp 1103–12, Proceedings – General, published by Eighth Commonwealth Mining and Metallurgical Congress, 1965. 399 Little Collins St., Melbourne, Vic., Aust. ^ Notes from University of Queensland Department of Mining and Metallurgical Engineering. Queensland Government Mining Journal (1958). ^ White FTM. Mining and Metallurgical Education....the Role of the University of Queensland. Queensland Government Mining Journal. July 1963. ^ "About JKMRC". University of Queensland. Archived from the original on 11 July 2016. Retrieved 11 July 2016. ^ "Julius Kruttschnitt". University of Queensland. Archived from the original on 14 September 2016. Retrieved 11 July 2016. ^ East, John W.: A Brief History of the University of Queensland Library, 2006. ^ "Libraries - About UQ - The University of Queensland, Australia". Uq.edu.au. 10 May 2011. Archived from the original on 18 April 2012. ^ "UQ Maps - The University of Queensland, Australia". www.uq.edu.au. Archived from the original on 30 June 2017. Retrieved 1 July 2017. ^ "A Key Experiment". Nobelprize.org. Archived from the original on 12 March 2017. Retrieved 12 November 2016. ^ "Australian Tim Munro wins his third Grammy". Skynews.com.au. 16 February 2016. Archived from the original on 7 April 2016. Retrieved 12 November 2016. ^ Williams, Sue (20 October 2012). "The Interview: Kate Morton". The Sydney Morning Herald. Archived from the original on 2 November 2016. Retrieved 31 March 2017. ^ "News Release: Dr Matthew Miles, CEO, MS Research Australia - one of two Non-Profit Fellowship Recipients". Retrieved 2 November 2018. ^ Funnell, Nina (10 October 2016). "Full list of universities exposed by sexual assault investigation". News Limited. Archived from the original on 2 August 2017. Retrieved 1 August 2017. ^ "Unis urged to act as 'shocking' survey reveals half of all students face sexual harassment". ABC News. 1 August 2017. Archived from the original on 8 August 2017. Retrieved 13 August 2017. ^ "Message from the Vice-Chancellor". Archived from the original on 14 August 2017. Retrieved 6 March 2018. ^ "Interview: Fossil Free UQ". Milaana Open. 26 May 2015. Archived from the original on 10 October 2017. Retrieved 10 October 2017. ^ "Students Escalate Demand For Universities To Drop Fossil Fuel Investments - New Matilda". New Matilda. 19 April 2016. Archived from the original on 10 October 2017. Retrieved 10 October 2017. ^ Mitchell-Whittington, Amy (18 April 2016). "Students protest for UQ to divest in fossil fuels". Brisbane Times. Archived from the original on 11 October 2017. Retrieved 10 October 2017. ^ "UQ meets Fossil Free UQ group". UQ News. Archived from the original on 10 October 2017. Retrieved 10 October 2017. ^ a b "Chancellor's letter to Fossil Free UQ". UQ News. Archived from the original on 10 October 2017. Retrieved 10 October 2017. ^ "UQ resolves not to divest from fossil fuels". UQ News. Archived from the original on 10 October 2017. Retrieved 10 October 2017. ^ a b "RIGHT NOW: Join us to #ExposeTheTies". Fossil Free Australia. Retrieved 10 October 2017. ^ a b "UQ students protest fossil fuel divestment +more Zedlines". 4ZZZ Brisbane 102.1FM. 10 October 2017. Archived from the original on 10 October 2017. Retrieved 10 October 2017. Thomis, Malcolm I. (1985). A place of light & learning : the University of Queensland's first seventy-five years (PDF). St. Lucia, Qld. : University of Queensland Press. p. 429. ISBN 9780702217975. Wikimedia Commons has media related to University of Queensland.